Students from across Ireland took part in the Intel Mini Scientist Grand Final at the Science Gallery in Dublin, an event which is the culmination of the nationwide competition which has been running since September 2015. The Intel Mini Scientist, which is now in its 9th year, gives primary school students from 4th, 5th and 6th class, the chance to explore science through project based learning and exhibitions. The first phase of the program involves students participating at local level exhibitions where Intel judges visit the participating schools, choosing two winning projects in each. The second phase saw each of these winning projects take part in the Mini Scientist Regional Finals which were hosted throughout December in Leixlip, Shannon and Cork. The 2015 / 2016 initiative was the biggest year yet for the Mini Scientist competition with more than 6,000 students from 105 schools in 14 counties of Ireland taking part in the Grand Final event. This year there were almost 2,000 projects exhibited as part of the Mini Scientist competition and the Grand Final brought together the top 22 projects from across the country. At the Grand Final, which was held in the Science Gallery in Dublin, the participants exhibited their projects for a panel of judges, which was made up from Intel employees, who had the difficult task of choosing the winning projects from the very creative variety. Each of the projects included visual displays, projects books and practical experiments based on a scientific area aligned with the national primary science curriculum. The Grand Final was attended by Damien English, Minister of State at the Departments of Education and Skills & the Department of Jobs, Enterprise and Innovation who had the opportunity to visit each of the participant projects before helping to award the prizes to winning projects. 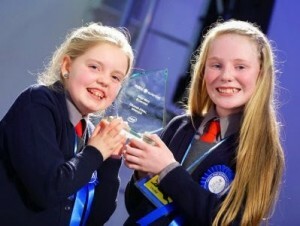 6th class students Laura Miller and Sinéad Buggy, who are both aged 12, were behind the wining project ‘Game Changer – Leaping Labradors’ which involved the creation of a digital game for visually impaired children. The girls conducted extensive research amongst a number of interest groups before embarking on the design of their video game ‘Leaping Labradors’. The game is a typical platform game with the aim of reaching the highest possible level whole collecting points along the way. The game is specifically designed for visually impaired players. As part of the prize for the overall winning project, Timahoe N.S. receives a grant of €1000 from Intel. Sarah Sexton, Head of STEM Programs at Intel Ireland, was delighted with the success of this year’s Mini Scientist Grand Final, “The projects on display here today are all winners in their own right and are a showcase of the months of hard work by thousands of young people across Ireland. Each student competing is a fantastic role model of innovation and creativity and has done a remarkable job in communicating their work. Intel is very proud to be at the heart of the Mini Scientist program and we look forward to seeing all that will be made possible by these young people in the future”. 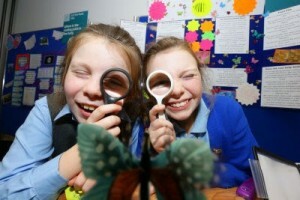 For more information about the grand final event or the Mini Scientist program visit www.miniscientist.ie.